Jon Stewart is only days away from ending his run as "Daily Show" host, and Denis Leary is still trying to figure out why he's leaving. "When we found out that you were offered this big contract and that you were basically turning it down to spend time with your family -- it was a big contract, they said it was $50 million," Leary said. "I think you're thinking of [Dave] Chappelle," Stewart interrupted. "Still it was a lot of money, right? We all thought the same thing which is this is a guy who is very brave, courageous, and a good dad," Leary continued. "Here's what I'm going to say ... what the f*** is wrong with you? Do you know how much f***ing therapy you could buy for your kids with 50 f***ing million dollars!" Leary, who made his 17th and final appearance on Tuesday, then told Stewart it wasn't too late to change his mind, saying Comedy Central can give the incoming "Daily Show" host, Trevor Noah, a different show. After all of the laughs, however, the moment between Leary and Stewart became somewhat sweet. "From the heart ... the decision you made was right," Leary told Stewart. "You're retiring at the top of your game." Then Leary pointed out that Stewart may get a bit bored with retirement. "It could be two months from now, it could six months from now, six weeks from now, you'll be on that farm in New Jersey with your family hanging out and your kids will turn to you one day and say, 'dad, we love you, get a f***ing job,'" Leary said. Stewart laughed, but said that what he'll miss the most is the people he has worked with over the past 16 years. "I also know you well enough to know ... that thinking about all the people that work here and whether or not they would still have jobs was a big thing for you," Leary said. "That's why I'm asking this, can I still come on the show when Trevor's the host?" Stewart smiled and slyly responded, "I'll be honest with you ... I don't think he's crazy about Irish people." "And if he is, you wouldn't be the one I'd start him with," Stewart said as he smiled and hugged Leary. 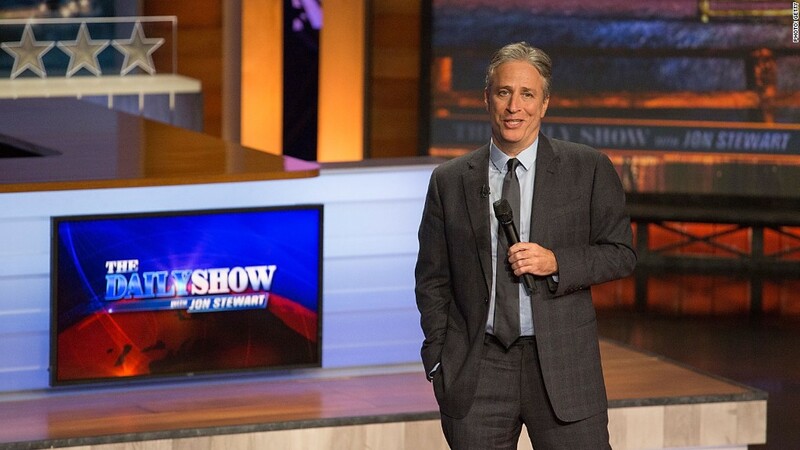 Stewart signs off of "The Daily Show" on Thursday.